For the first time on record, two Category-4/5 storms have formed in the month of October. Major Hurricane Matthew was the first Category-5 storm since Felix , and the longest-lasting Category-4/5 October storm on record. It was also the first ever "M" Hurricane to make U.S. landfall. Hurricane Alex was the first Hurricane to form in January since 1938. 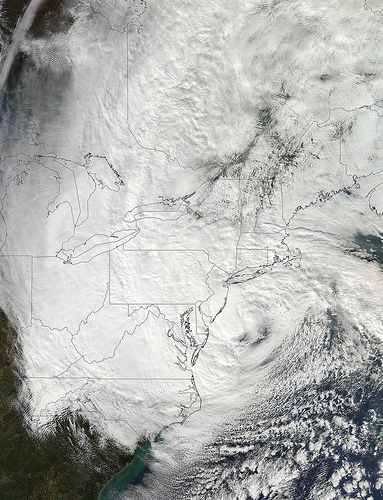 Sandy was the 29th Hurricane since 2010, the second busiest 3-year period in history. Making landfall on October 29th, post-tropical "Superstorm Sandy" caused devastating Mid-Atlantic coastal erosion, and set all-time records for NJ state low pressure, and storm tide at The Battery. I saw someone forecast that a Hurricane was going to hit Florida in a week to ten days. Can they know for sure? No. Hurricanes and Tropical Cyclones are relatively small and complex systems. In fact, the average forecast track error five days out is currently around 250 miles. Further into the future, track errors grow even larger; for comparison, the distance from Corpus Christi to Port Arthur is 250 miles. This is exemplified by the miscalculated tracks of Hurricanes Ivan (2004) and Ike (2008) and especially Tropical Storm Debby (2012) - see images below. A big contributor to this forecast error is Chaos Theory, which is further examined on our FAQ Page. Fox News : Your World [October 2016] - Weather 2000 analyzes Major Hurricane Matthew and the storm surge and coastal flooding impacts along the U.S. East Coast. Fox Business : Cavuto [September 2016] - Weather 2000 addresses Hurricane Hermine and the storm surge and coastal flooding impacts in Florida and the Mid-Atlantic. BNN [May 2016] - At the beginning of the Atlantic Hurricane Season, Canadian Business News Network (BNN) prompts Weather 2000 about the forecast for an active season, and the potential impact on the Energy, Agriculture and Reinsurance industries. Fox Business : Cavuto [October 2015] - Weather 2000 updates the Fox Business Network on the progress of Major Hurricane Joaquin. BNN [June 2015] - Canadian Business News Network (BNN) asks Weather 2000 about talk of a "Super El Nino", and its impact on the Atlantic Hurricane season and record-breaking drought in California. BNN [June 2014] - Canadian Business News Network (BNN) discusses the Summer outlook with Weather 2000. Topics include the 2014 Atlantic Hurricane Season, and the impact of heat and drought on energy and agricultural commodities. Insurance Journal [April 2014] - Weather 2000 advises readers of Insurance Journal to rein in expectations for immediate El Nino impacts. BNN [March 2014] - Canadian Business News Network (BNN) interviews Weather 2000 about the cold, harsh Winter transitioning to a hot Summer 2014, and the associated stress of heat, drought & tropical storms on the prices of natural gas, agriculture and other commodities. WABC-TV [October 2013] - On the 1 year anniversary of "Superstorm Sandy", WABC-TV asks Weather 2000 about its unique track, and the damaging storm tide at Battery Park. BNN [October 2013] - Canadian Business News Network (BNN) asks Weather 2000 how Tropical Storm Karen is impacting Gulf of Mexico oil and natural gas rig operations, and the Gulf Coast tourism industry. Bloomberg.com [September 2013] - Weather 2000 notes the flooding and landslide threat to Mexico from Pacific Tropical Storm Manuel and Atlantic Hurricane Ingrid. WABC-TV [April 2013] interviews Weather 2000 about an active Summer for Heat Waves and Hurricanes. SNL Financial [October 2012] - Weather 2000 portrays the grand scale of Superstorm Sandy, including impacts of storm surge flooding, to readers of SNL Financial. Fox Business : Cavuto [October 2012] - Weather 2000 updates the Fox Business Network on the progress of Superstorm Sandy. Curtis Sliwa on AM 970 The Answer [October 2012] - Weather 2000 brings up-to-the-minute information on Superstorm Sandy’s landfall to listeners of Curtis Sliwa on AM 970 The Answer. SNL Financial [October 2012] - Weather 2000 outlines the far-reaching extent of Hurricane Sandy to readers of SNL Financial. Consumer Insurance Guide [April 2012] - Weather 2000 discusses the upcoming Hurricane Season and its implications for residents and businesses from the Gulf Coast to New England. AM 970 The Apple [August 2011] - Curtis Silwa turns to Weather 2000 to help his listeners prepare for Hurricane Irene’s arrival. Fox News Radio [August 2011] - Weather 2000 helps Fox News Radio listeners navigate through both the hype and realities associated with Hurricane Irene as it approaches the East Coast. Bloomberg News [October 2010] - Weather 2000 again reminds Bloomberg readers of the physics dictating Hurricane Richard’s pending demise in Central America, despite egregious forecaster fearmongering of a hurricane in the heart of the Gulf of Mexico. Bloomberg News [September 2010] - Weather 2000 highlights the physics dictating Tropical Storm Matthew&apos;s pending demise in Central America, despite egregious forecaster fearmongering of a major hurricane in the heart of the Gulf of Mexico. WNYU Radio [August 2009] - Weather 2000 discusses Tropical Storm Danny and Hurricane threats to New York on WNYU radio. Bloomberg News [September 2008] - Weather 2000 warns Bloomberg News readers that Hurricane Ike will have a much larger impact on the Gulf of Mexico as compared to August’s Hurricane Gustav. Fox News : Your World w/ Neil Cavuto [August 2007] - Weather 2000 discusses how the remnants of Hurricanes can cause flooding impacts thousands of miles away from where it makes landfall, and that the heart of the Season still lies ahead of mid-August. Bloomberg News [October 2006] - Weather 2000 offers insights about the vagaries of Seasonal Hurricane Forecasts to Bloomberg News readers. HBO [August 2006] - Weather 2000 contributes research to and is interviewed by Spike Lee in his Documentary on HBO. Discussed are the risks to coastal communities posed by hurricanes and sea level rise, as well as future threats to the big metropolises of Washington D.C., Boston, and New York City. CNN Money [May 2006] - Weather 2000 tells CNN Money that Gulf of Mexico waters are currently warmer than at this time last year, and that the US energy complex should prepare for another quick-starting Hurricane Season. MSNBC : Rita Crosby Live & Direct [November 2005] - Weather 2000 wraps up the 2005 Hurricanes Season and warns businesses and residents about the potential for another volatile and active year of weather in 2006. Fox News: The O'Reilly Factor [October 2005] - Weather 2000 advises The O'Reilly Factor that more active Hurricane seasons as well as harsh winters will be in store for several years to come. CBS Early Show [September 2005] - Weather 2000 warns residents about Hurricane Rita's potential impacts and cautions that new cycles will increase the vulnerability of homes and businesses. CNN : Wolf Blitzer Reports [July 2005] - Weather 2000 talks of extreme Summer heat waves and hurricanes, and fierce Winter chill, threatening the nation this year and years to come.